I feel like I’ve written extensively on the subject of adaptations, covering it in my reviews of Life of Pi and The Great Gatsby for example. Adaptations are a strange and contradictory beast. All adaptations must balance being true to the spirit of the original work with the desire to bring creativity and imagination to their version of the story. David Fincher is a director well suited to one of these two things. Whether with The Girl With The Dragon Tattoo or Fight Club he knows how to successfully bring well-loved books to the big screen. However, I would argue the creativity and vision of a true auteur when doing so. He is the director a writer wants to work with since it will primarily be the writer’s version of events which ends up on the big screen (cf. Aaron Sorkin’s The Social Network). 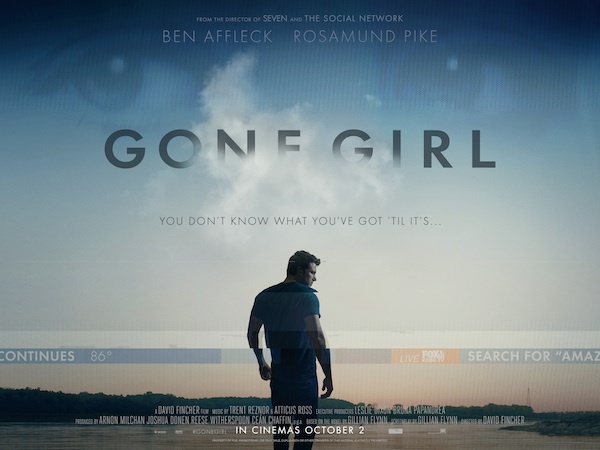 In the case of Gone Girl, it is difficult to see any changes Fincher requested from Gillian Flynn’s book, since the two are virtually indistinguishable. The film relies entirely on the strength of the plotting, story and characters of the source material. This is by no means a bad thing, since the book is one of the most exhilarating and clever novels I have read in recent years. However, for me the experience does not differ much from merely re-reading the book.